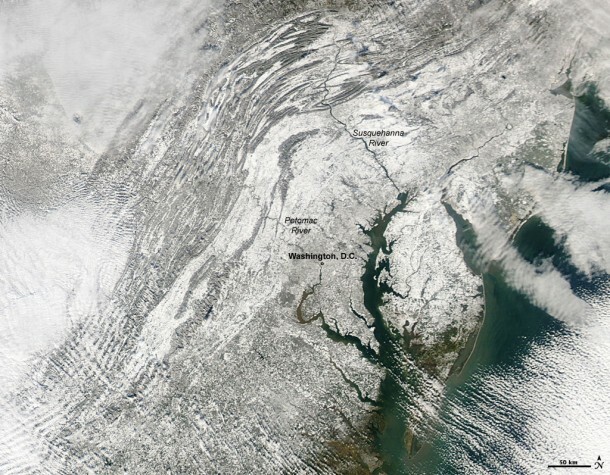 The Mid-Atlantic states were completely white on Sunday, December 20, 2009, in the wake of a record-breaking snow storm. The storm deposited between 12 and 30 inches of snow in Virginia, Maryland, and Washington, D.C. on December 19, according to the National Weather Service. For many locations, the snowfall totals broke records for the most snow to fall in a single December day. The Moderate Resolution Imaging Spectroradiometer (MODIS) on NASA’s Aqua satellite captured the above view of the Chesapeake Bay region as the clouds were clearing on December 20. The snow highlights the courses of the Potomac and Susquehanna Rivers from the Appalachian Mountains to the Chesapeake Bay. The ridges and valleys of the Appalachian Mountains are similarly highlighted. The forested peaks are darker than the snow-covered valleys. The massive snow storm was a Nor’easter, a powerful storm characterized by a strong low-pressure center that forms in the Gulf of Mexico or the Atlantic Ocean and moves northward up the Eastern seaboard. In the Northern Hemisphere, winds flow in toward the center of a low-pressure area in a counter-clockwise spiral, which means that as the storm heads north, the leading winds come in off the ocean from the northeast.